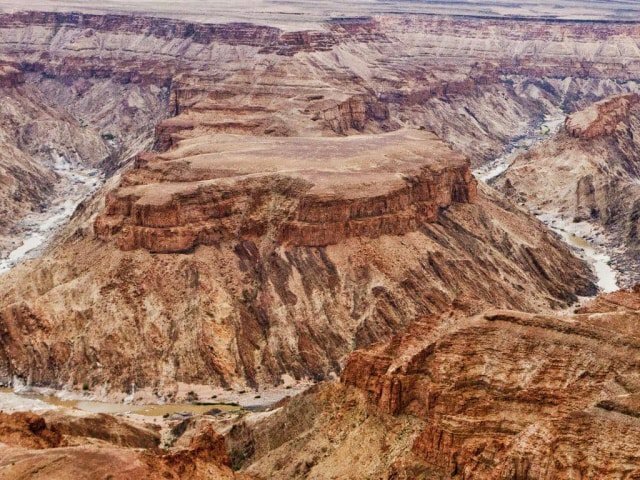 Carving out an epic rocky wonderland in the south of Namibia, the Fish River has created Africa’s largest and the world’s second largest canyon. Hot, dry and stony, the Fish River Canyon measures a whopping 160 kilometres in length, at times 27 kilometres in width and 550 metres in depth. The awe-inspiring natural beauty of this ancient geological marvel draws visitors from around the globe. For those looking for adventure, the intense 85 kilometre Fish River Hiking Trail through1.5 billion years of geological history will definitely thrill avid adventure enthusiasts, and for visitors looking to relax, head over to the canyon’s southern end to enjoy a soak in the mineral waters of the renowned hot springs of Ai-Ais, or take in the spectacularly scenic views from Hobas Restcamp as well as numerous other viewpoints along its rim. Other popular activities include: scenic chartered flights, horse riding, nature drives and seasonal kayaking.